In 1993, the United Nations adopted its first resolution on sport, marking the fact that sport had been used as a development tool for many decades. Requested by Egypt, on behalf of the Organisation of African Unity, the resolution recognised the contribution that sport plays not only as a awareness-raising tool, but as an important means of promoting tolerance and respect, empowering girls and women, and contributing to a range of other health, education and social inclusion development outcomes. ChildFund’s sport for development programming is focused on building the resilience of children in marginalised communities in Asia. Here we reflect on how sport can be used to improve the lives of children in disadvantaged communities, and ChildFund’s first-hand experience in developing its own sport for development program. With the exception of using of sport for advocacy, in the international aid sector the implementation of sport for development programs (S4D) has grown slowly since that 1993 resolution. This has been largely due to a lack of publicly-available evidence on the development impact of these models. Obtaining this evidence has been further hampered by the fact that S4D programs can have widely varying objectives, with some NGOs using the model to challenge risk-taking behaviours among youth, while in other instances sport is used as a means provide psycho-social support to children impacted by war and displacement. Today, however, a growing body of research suggests that the international appeal and reach of sport can provide an engaging platform for learning across different geographical, social, cultural and political contexts. Well-designed S4D interventions have been proven to benefit social integration and the development of social capital, conflict resolution, economic development and post-disaster trauma relief. For child-focused NGOs, the implementation of S4D programs is also an important means of upholding Article 31 in UN Convention on the Rights of the Child: a child’s right to play. For ChildFund, the S4D journey began in 2014, with the launch of a small pilot program in Laos. Aware of the shortage of data in this area, our objective was test the effectiveness of sport as a development intervention, before making a major investment into future programs. Critics of S4D will state that as development programs, the models are not rigorous enough to address the complex challenges that vulnerable children and young people face. As ChildFund, we place a high value on developing a co-ordinated and scientific approach to measuring change. As such, from the outset ChildFund instituted a range of tools to measure outputs, outcomes and impact at individual and community levels. 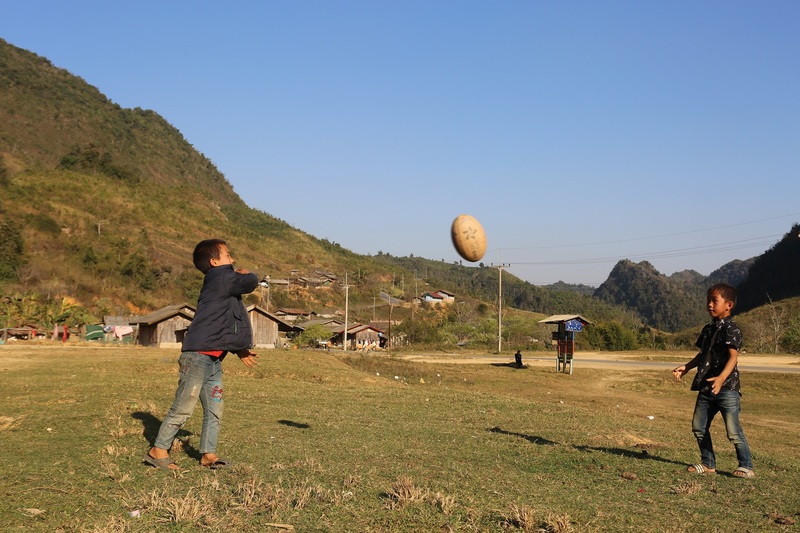 In five villages of northern Laos, ChildFund’s S4D pilot used the games of soccer, volleyball, tag rugby and sepak takraw (kick volleyball, a popular game in south-east Asia) – games both familiar and new to the children and youth taking part. As the project progressed, it became evident that something interesting was happening around rugby. Unlike the other sports on offer, in rugby the majority of players were female. We realised that as a new and fairly unknown sport in Laos, rugby was not gendered so there were no pre-conceived notions of who should play. Many of the girls involved in the pilot didn’t want to play the other games where boys knew the rules and were seemingly “better” than them – soccer was a example of this response. But with rugby, no one knew anything about the sport, so girls could not be “told” how to do it by the boys. Boys and girls were all learning the rules at the same time. Seeing this as a unique opportunity, ChildFund committed to making a more sophisticated program designed to address specific challenges for young people, focusing heavily on addressing gender inequity. ChildFund Pass It Back uses tag rugby to teach a range of important life skills in areas including leadership, problem-solving, gender equity, conflict-resolution and planning for the future. An independent evaluation in 2017 found the program itself, as well as its processes, were among some of the best in the world for connecting sport and development outcomes. Evaluator and report author Kylie Bates of Game Changes notes: “The curriculum and program activities contribute to both sport and development outcomes effectively. Building young peoples’ social and emotional skills is one of ChildFund’s five key sectors. The organisation recognises that social and emotional competencies influence how well young people adjust to their environment and how much they achieve in their lives. Thus, in an increasingly fast-changing, complex and diverse world, ChildFund’s S4D interventions aim to build the capacity of young people to adapt, be resourceful, respect and work well with others, and to take personal and collective responsibility. This in turn builds their resilience by enhancing protective factors and reducing risk factors. As an example, ChildFund Pass It Back’s coach development process, a standout initiative, helps youth develop new skills while working to change the way they perceive their value in their communities – enabling them to become confident, capable and resilient young leaders. Overall, ChildFund’s experience demonstrates that S4D interventions have the potential to work at scale and contribute to positive change even without pre-existing interest in a sport by participants. In practice, this has proven advantageous in providing a more gender equitable platform for participation as over 50% of ChildFund Pass It Back coaches and participants are female – a world first for entry level rugby program..
Strategic partnerships have also been vital. At the international level, ChildFund partners with a wide range of stakeholders to pool resources and expertise to ensure the quality of both sport and life skills components of its S4D interventions. As an example, Women Win has played a key role in ChildFund Pass It Back in the development of curricula and monitoring and evaluation tools based on their experience working with young women and girls through sport. Furthermore, partnerships with Asia Rugby, World Rugby and national federations have been crucial in accessing sports expertise to ensure that the sport component of our work is high quality, and in providing opportunities for ChildFund Australia to access existing communication platforms to advocate for children’s rights. More than five years have passed since the launch of our S4D pilot, and ChildFund Pass It Back has grown way beyond those first five small villages in rural Laos. It has now expanded to Vietnam, the Philippines and Timor-Leste. In 2017, the program won the UNICEF Safeguarding Children in Sport Award at the prestigious Beyond Sport Global Awards. More recently, World Rugby announced ChildFund as its principal charity partner for Rugby World Cup 2019. ChildFund Pass It Back is a key component of World Rugby’s social legacy program Impact Beyond, and funds generated from the tournament will give more than 20,000 disadvantaged children and youth in Asia the opportunity to benefit from involvement in ChildFund Pass It Back. Most importantly, ChildFund Pass It Back continues to strengthen the resilience of disadvantaged children and youth, equipping young people to overcome challenges, inspire positive social change and “pass it back” to their communities.